The Rotman Alumni network helps over 14,000 alumni in more than 70 countries worldwide stay connected. 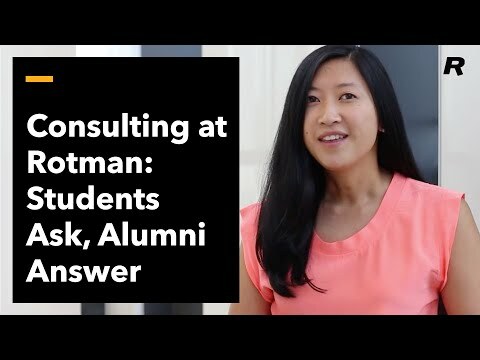 Through our alumni events and lifelong learning opportunities, Rotman makes it easy for our graduates to connect with each other, learn and give back to the Rotman community. At Rotman, we make it easy for our graduates to connect, learn and succeed. Year round, alumni are invited to events that feature a roster of exciting speakers, and offer an opportunity to gain new knowledge, and expand their business circle with new contacts. The alumni network provides lifelong career support through job postings and other resources, ensuring our graduates continue to find and share in their professional and personal success. Because the Full-Time MBA is a two-year program, you develop an impressive network even before you graduate. The interaction between the incoming and outgoing classes is one of the most important advantages of Rotman’s 20-month program structure. Your network will extend far beyond what is possible in a one-year MBA program, where the timeframe to get your know your peers is much shorter, with no interaction between classes. As we increase the number of MBAs graduating each year, the size and scope of the Rotman alumni community will grow significantly, making this network an even more powerful asset for you throughout your post-MBA career.